This is probably a no-brainer, but when I recently started using false eyelashes, I peeled that sucker off my lids because that's what the packaging said on how to remove it. Well, the glue is sticky. It was a pain getting them off and I was losing lashes along the way. And getting a glue out off your lashes by pulling it with just your fingers will makes your pretty and long fake lashes sparse. So here is a way to minimize the pain and prolonging the life of your falsies. Step 1: Take the cotton swab and put your eye makeup remover of choice or the extra virgin olive oil (EVOO) (for this illustration, I opted for the EVOO). Make sure it's not soaking wet, this stuff will get in your eye. 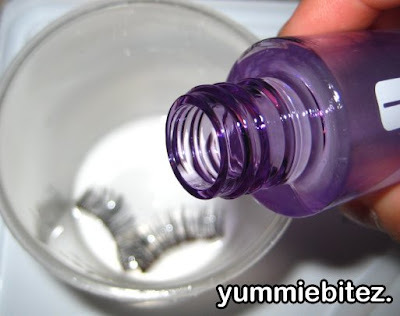 Step 2: Dab and swipe some eye makeup remover/EVOO along where the lashbone of your falsies on your lids. Try to avoid your eye as much as possible. Using a cotton swab, as opposed to rubbing a cotton ball, will help maintain the shape of your falsies. Step 3: Let it the eyemakeup remover/EVOO sit for awhile and let it work its magic. 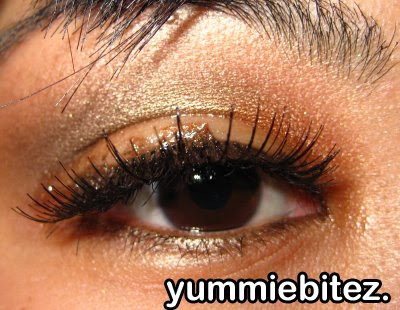 Step 4: After a few minutes, you can pull your falsies starting from the outer lid. Your false eye lashes should come off easily. If not, repeat step 2 and 3. Step 5: After you've taken falsies off the other eye, clean the rest of your eye makeup and your face, and you're done! 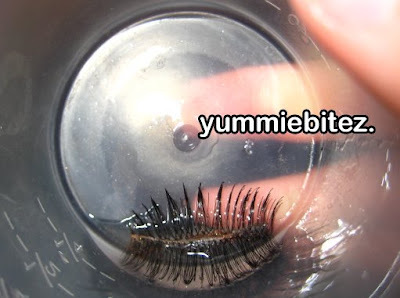 Step 1: Put your lashes in a clean container, and soak it a bit with your eye makeup remover (I wouldn't suggest cleaning it with EVOO. 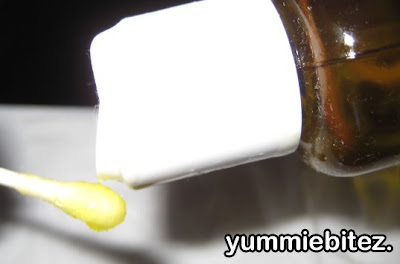 However, you can substitute with a soapy water). Step 2: Let your lashes soak in your eye makeup remover for a bit. 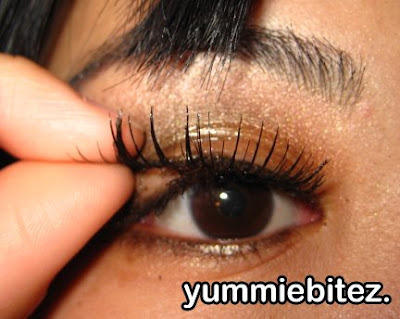 Step 3: Then take your falsies out of the container, and while holding where the lash hairs are, gently pull off the glue on a lash bone using a tweezer. 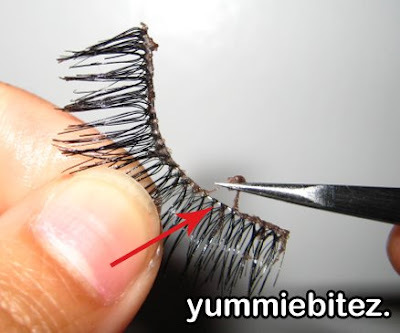 Or you can wipe your lashes off with tissue in the direction away from the hair of your fake lashes to get the glue out. The glue should be really soft enough and less sticky that it won't tug any hair off. 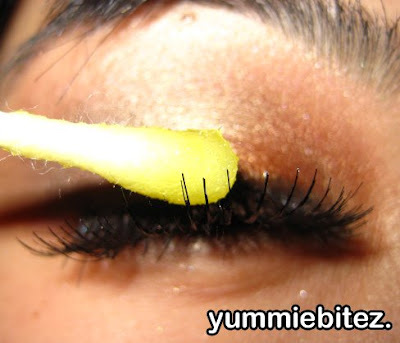 Step 4: Let your lashes dry on top of a clean tissue. Groom it with a lash comb if necessary. Then store it back to the packaging after it has completely dried. And you're done! As you can see in the picture, the falsies to your right does not look as nice as the one on its left. Why? Because I made a mistake and pulling the glue off with my fingers. And since the glue is still sticky, I'm pulling off some hair along with it because I'm yanking it off (I wasn't thinking then). I know this can take some time, but your eyelashes grow much slower. The lashes you lost from pulling your falsies straight out of your eye takes about 8 weeks to grow. So if you're taking the easy way out frequently with your falsies, you probably have less lashes compared to when you started. This will also help in extending the life of your lashes, so you don't have to replace them right away. If you guys have any questions, please let me know. I hope this helps. Bliss: Ok i thought it was just me who pulls my falsies out! well i'm glad you found this tut helpful. I didn't know about the EVOO too. no wonder it didn't come off nicely. 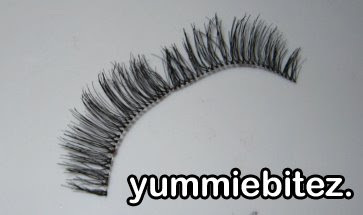 what brand of false eyelashes do you use? I really wanted to try falsies, but I just don't want them to be thrown away or be wasted...thanks for this tip...good thing we have ardell here in Manila :) will give this a try! Yeah, I always just yank those suckers off. LOL. I don't really pull any lashes off, but I do end up with gunk on my lashline, which is SO difficult to deal with. Ugh. Good tips! lurve: I actually didn't have any problem with soaking them with mu remover. maybe it depends on what kind of makeup remover or falsies? maybe if you used the makeup remover that makes your eye sting it'll ruin your falsies... or if the falsies are made out of plastic material? but when I did this my falsies were still good. great post! i was pulling mine out for a while and i think my lashes are shorter now because of it :( now i spray some fix plus on my eyes and the lashes seem to come right off too...i've ruined a couple of lashes by picking off the glue with my fingertips...i think i'll use a tweezer from now on, thanks hon! bah, i'm too damn lazy to clean my falsies. i just use them several times and once they start getting icky, i toss them out and move on to a new pair. plus, i buy the cheap $2.45 ones at madam madeline, so no big loss. ren ren: i did the same thing you did the first time i had it on. i was thinking there must be away to get the glue off my falsies without pulling any hair. gezebel: hahaha i saw your two drawers of falsies!! i'm too cheap and too poor to keep buying them. it adds up you know. haha why not recycle when you can. Excellent advice, at first I used Ponds cold cream to clean and remove the false lashes. That was a big mistake my false lashes were ruined. Now I use your advice and the lashes come off beautifully. Great advice!! I've visiting this site for the first time and too experience pulling out my natural lashes when trying to remove individual lashes. I added the individuals for the first time (always wanted to get lashes) 2/21, while most of them are off, some of them are still on. How long should you keep false lashes on? @Anonymous: I usually take my false lashes off at the end of the day. It's part of removing my makeup before going to sleep. I removed my falsies and cleansed it with some makeup remover that's in wet tissue form. But I've got some cotton strands on the falsies. This way are they still useable? Thank you so much for the tips :) I just used fake eyelashed today for the first time and they turned out so good. Thats when I turned to your tutorial on taking them off after taking the right one off it felt like I was ripping of my eyelid. #ouch Anyway thank you! Picked up a pair of false eyelashes on clearance at the drugstore, I have always wanted to try them. It wasn't as easy to put them on as I thought it would be but I liked the look of them after I finally got them to stay and I was going on a date, so I figured why leave them on. My date commented on how beautiful my eyes are...YEAH THEY WORKED. lol I got home and thought, how do I get these off now and found this tutorial, which made getting the lashes off a much better experience than putting them on and now I can re-use them. THANK YOU! Thank you so much! It really worked. I had the glue that last for a long time and I thought that it would never come off!!! I don't remember the name of the glue but it sucked really bad. When it dried it got crusty and it hurt really bad!!!! So thank you for the tutrioal because I was going insane!!!! Thank you for this wonderful post! I'm wearing falsies right now and I was dreading the removal process until I saw your blog post haha. I really like reading this blog. Its a very helpful blog for me. The steps mentioned in this blog is very useful. Keep sharing. Michael ToddAwesome! Immense information there. Thanks, and you look great by the way :) Very detailed, I must agree it's the best way to remove falsies and take care of them :) Quite helpful :) I know that after a period of frequent wearing falsies, I had to restore my own eyelashes. My friend suggested to do that with the help of castor oil or good serum. 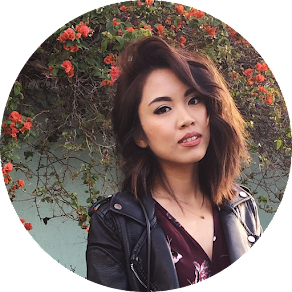 I don't really like sticky oils so I restored my eyelashes with the help of Cherish Lash serum! I find your article very helpful.